Resplendent in four natty colours, Palm's feature-rich multimedia phone goes for the for the consumer market. 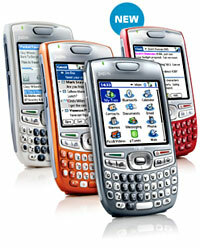 Palm has introduced a new range of quad-band Palm Treo 680 smartphones, running the tried and trusted Palm OS. Backed by a $25 million marketing campaign - their biggest marketing campaign in half a decade - Palm is hoping that the lower priced Treos will attract customers beyond their traditional business base. The GSM/GPRS/EDGE phones will be offered in a range of attractive colours (Graphite, Copper, Crimson and Arctic), weighing 23g lighter than the last PalmOS Treo, the 700p, and measuring up at 6mm longer and 3mm thinner. Like the Windows-powered Treo 750w released earlier this year, the Treo 680 comes without the pocket-bulging, iconic chunky antennae, something which Palm thinks will have a positive impact on the European market. 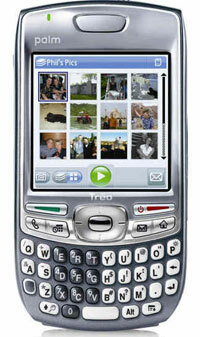 The Treo comes with a large and bright 320x320 screen and the well regarded full QWERTY keyboard, with a raft of multimedia functions including an integrated digital camera, Bluetooth 1.2 , MP3 player, video recorder and player. Onboard, there's 64MB of user-available storage - nearly three times the capacity of the original Treo 650 smartphone - with expansion card support up to 2GB. Although the Treo 680 is still lagging behind with the latest technology - there's still no W-CDMA or Wi-Fi support - its superb user-friendly interface still puts it streets ahead of some higher spec'd phones. Like its Palm OS predecessors, the 680 displays text-messaging conversations as IM-like "threaded chats," a fabulous feature that should be introduced by law on all phones. The phone also lets users respond to calls by firing off a preset text message ("bog off weird stalker person"), and there's support for three-way calling. Along with the usual bundled applications for e-mail, Web browsing, messaging, multimedia, calendar and contacts, there's a special version of Google Map for the Treo. Billed by Google as,"the fastest, slickest version yet," the application offers real-time traffic reports, detailed directions, integrated search results (search for cafes/bars etc, get addresses and call them with one click), satellite imagery and fast-downloading detailed, draggable maps with translucent pop-up balloons. Sadly, us in Britland will have to wait for a while as the program currently only offers maps for Canada, France, Germany, Italy, the Netherlands, Spain and the US. Palm has also announced that it will be partnering with several media companies, including Yahoo, Google and blogging firm Six Apart, to make their products available on the new device - these will join the enormous back catalogue of commercial and free software that's already available for the OS. Palm head honcho Ed Colligan said he expects the new smartphone to be available around the world by the end of June, 2007, "competitively priced with comparable smartphones in the marketplace," with the price rumoured to be around the $200 mark. It's estimated that more and more people are going to be using smartphones and your regular consumer is going to be looking for style, decent multimedia features and - crucially - ease of use. 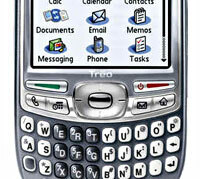 We can see lots of people wanting to get their hands on something that looks as cool as the Treo and is simple to use. The 680 may not have ultra-cutting edge features, but it can play back MP3s, store maps, surf the web, get email, play videos, take pics and videos, blog directly, edit Word/Office docs better than Microsoft's own machines and it has by far and away the best SMS interface on the planet. And if all that is coming in a cheapo package, we reckon Palm may have a hit on their hands.